If there’s truth in the axiom that everyone loves a good mystery, there’s hope for Victoria Park subway station. The nearly 49-year-old TTC stop and the parking lot on its south and west flanks need all the love they can get, even in Toronto’s hot real estate market. And, yes, while there’s no imminent shutdown date for our local transit-oriented parking lot, the 2.1-acre site is on the market. It’s unloved though some would say the property has it all – rapid-transit access, loads of adjacent density, award-winning station design and motivated owners (you and me; our agent is Build Toronto). “NIMBY resistance to intensification is also unlikely,” says a real estate executive, adding to the list of pluses. So, what self-interested developer could possibly resist? As it turns out, all of them. 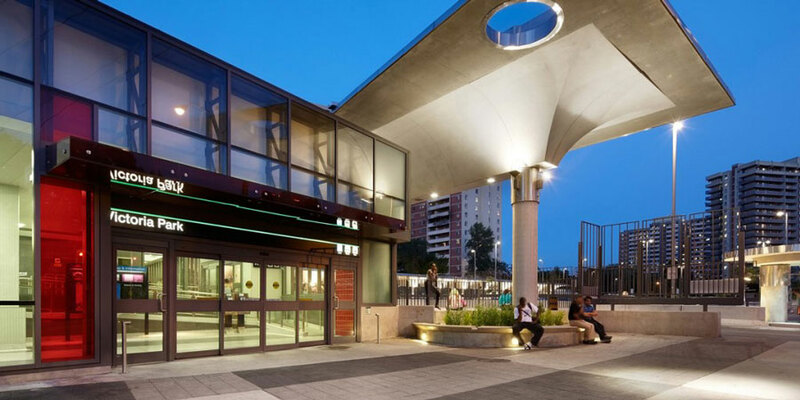 The site was declared surplus to TTC needs in 2009 and transferred to what became the seed portfolio of Build Toronto, a city entity bringing private-sector expertise to selloffs and redevelopment of selected public lands. Acknowledgment of Vic Park’s profit potential goes back further, at least to 2002, when the always-financially-challenged TTC put it on an A-list of assets to cash in on. Fifteen years later, the overwhelming reality is an underperforming parking lot. The TTC expects 2016 revenue of $165,000 (it’s a money-loser if you account for opportunity costs, a top concern for real estate managers). Parking doesn’t help ridership much either: The 173 stalls are 94% occupied on an average weekday – enough passengers to fill just one of the six cars on a standard TTC train. Build Toronto is a laudable concept (though let’s hope the current citywide real estate review sees the room for improvement). Aside from the $70-million in dividends BT has delivered to the city since 2010, it’s mandated to include new affordable housing in its developments and is creating housing for ownership by low-income people. While it would be nice to see some of that in whatever rises from the Vic Park asphalt, it’s also time for East Enders to examine BT’s vision for the property, especially its stated emphasis on residential use with secondary retail. So, does Victoria Park station – with at least 6,116 high- and mid-rise units and hundreds more houses within a six-minute walk – lack residential density? Should we bring more low-income households to a dense neighbourhood that already has more than its share? Is a site close to the Danforth and Shopper’s World crying out for retail space? And, if this is to be transit-oriented-development, shouldn’t we question land uses likely to worsen morning-rush crowds on westbound subways while transit-oriented opportunity keeps rolling east untapped on mostly empty trains? East Enders and the city as a whole should benefit most if Vic Park station becomes a multiuse destination in the morning (better still if it were all day). Office space or educational and institutional facilities might do it. Not only should people be riding transit to Vic Park in the a.m., but some of the thousands living nearby should be able to walk to work. Kim Storey and James Brown, whose Brown + Storey Architects earned national and city awards a few years back for their redesign of the actual station – a green roof, new bus terminal and a thoughtful approach to light and entranceways – have studied the whole area and see an innovation incubator with offices and creative light industry (like 401 Richmond downtown) as possible puzzle pieces. “Redevelopment with generous public space and better pedestrian links to all the surrounding areas for a range of daily functions is essential,” they say. Of course, there are complicating realities. It all presents a case study for planning scholars. Storey suggests a design competition might be in order. Luckily, it’s early days. Many good people, including city planners, are onto the mystery. But the experts will need the public’s ideas, and while we’re at it we could provide a little love. This column is part of a recurring series tackling urban issues in the East End. Find author Stephen Wickens on Twitter @StephenWickens1.